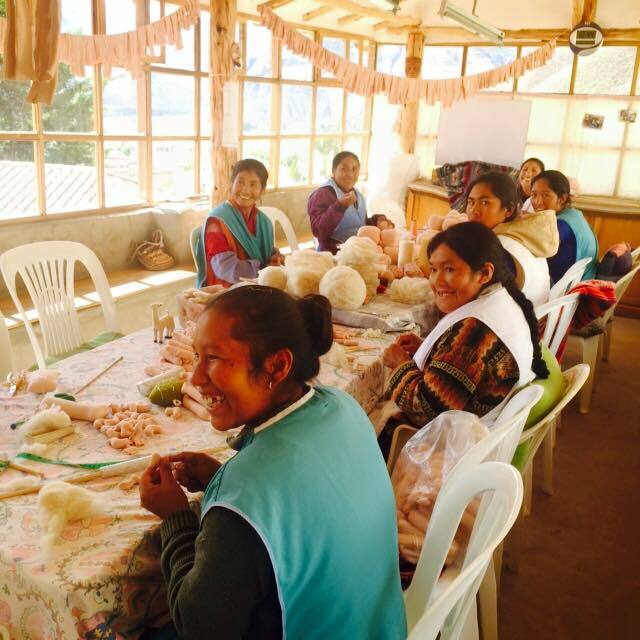 The Q’ewar poject is a social and economic initiative working with the indigenous women living in the Quechua Community of Q’ewar in Southern Peru. 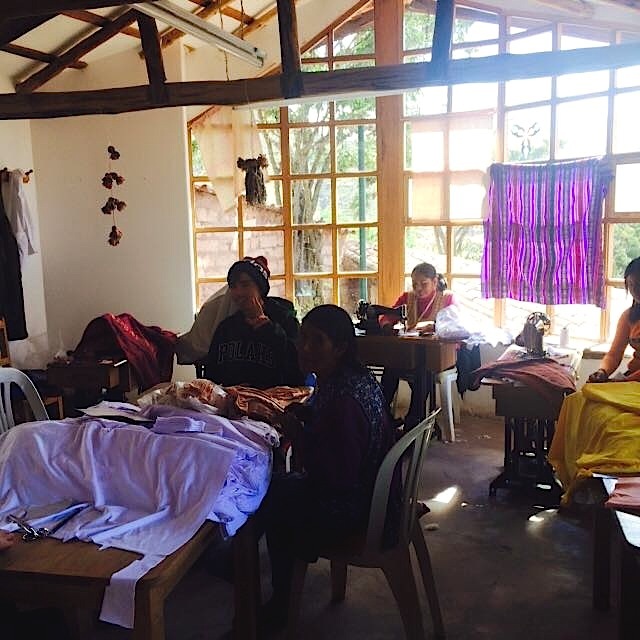 The women of the Q’ewar Project live in extreme poverty, and for most, this is the first chance they have had to learn skills to earn money in a humane and respectful working environment. Although the project is young, the original intention to provide the opportunity for these women to improve the difficult conditions of their lives is bearing fruit, little by little. The project is self-sustainable and everything that has been accomplished by the project has been possible because of the beautiful dolls the women make. Unlike many of the dolls made with plastic and other toxic materials, the dolls are made with natural fibers from the interior, stuffed with pure sheep’s wool, to the dolls’ hair, made from alpaca yarn. The women wash, card, and spin the wool used for hair, sweaters and shoes, sewing and knitting all the distinctive clothes. Hand dyed fibers color the hats and the panchos. Much of the dye used is made from indigenous plants. The dolls’ clothing reflects a wide variety of styles worn by the rural dwellers. Most importantly, unlike the mass-produced dolls that companies like Mattel manufacture, these dolls are made with love and joy by the very hands of the women whose lives are being changed by the dolls. The Project is located in a beautiful commune-like complex nestled in the hills of Andahuaylillas. As you walk in, the first aspect that catches your attention is the loving and nurturing community that women build as they work surrounded by large windows that let in the healing light of the sun and the beauty of the surrounding landscape. Here, the women lift each other, teach each other, and inspire each other to be more than they have been treated. It’s a place where women can recapture their sense of self-worth and confidence, stripped away by centuries of colonization. 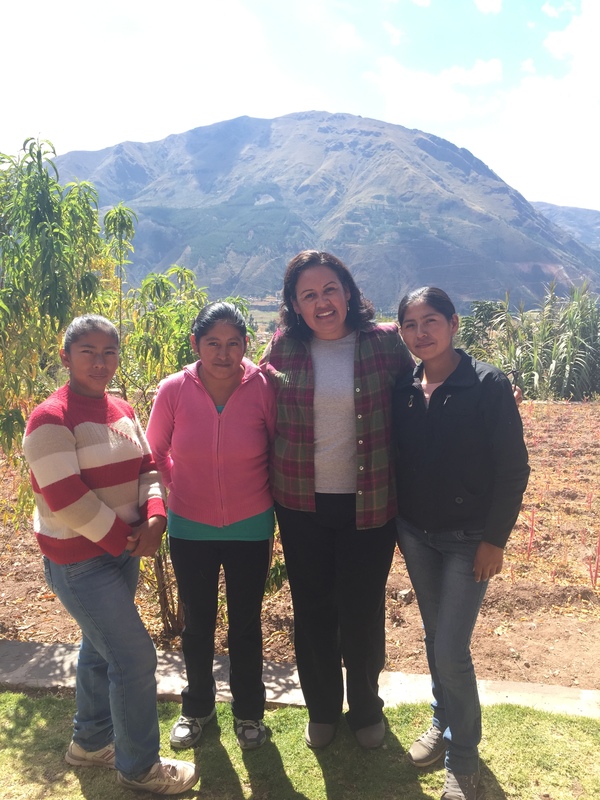 In a world in which the Quechua women often suffer marginalization through domestic violence, modern economies, and social systems that perpetuate ethnic discrimination, the Q’ewar Project offers them a space for healing, reconnecting, and building a dignified life. In this beautiful space founded by Don Julio Herrera and his wife Lucy, women are able to come together and act on their concern for creating a more just and moral society. While engaged in their work,women share personal stories and discuss issues pertaining to child-bearing and rearing, personal and family health, economic stability, sustainable agriculture, access to natural resources, spiritual practices, etc. Women circles have been around for centuries, and they have been the hub for the sharing of wisdom and solidarity as well as the incubators of transformative ideas and visions. By teaching and empowering each other, these women, our sisters, are changing the course of how their children will participate and contribute to their community. I had the honor of listening to some of the stories these inspirational leaders shared. In telling their stories, they are able to heal and find the strength to continue to transform their lives and the lives of others. Vilma, one of the women with the most longevity at the project was recently asked, by one of the service learning students I mentored at the project, Alana, if she owned one of the dolls she had hand-made for 13 years. When Vilma responded no, Hanah took it upon herself to purchase a doll for her, and had Vilma select the doll of her choice. This act of generosity overwhelmed Vilma, but not just for the obvious reason. Vilma lost both of her parents when she was eight years old. As a result, she had to work from a very young age to support herself and her siblings. The doll Alana gave her was the first doll anyone had given her, and the first doll she had owned. The doll she had yearned for since she was a child had finally come to her at age 40. Vilma felt in her heart that her mother’s spirit had nudged Alana’s heart, so that through Alana’s gesture, she could finally give her daughter the doll she had not been able to give her. In this act of kindness, Vilma was not only able to find healing for the little girl inside of her whose childhood had ended so abruptly, but she was also finally able to find closure to her mom’s death, because she had a presentiment that her mom had been with her all along. Witnessing all of this allowed me to see that this is what the magic of life looks like when we are open to it. Paulina is another woman I met through the Q’ewar project. I felt drawn to her spirit before I knew I’d become such good friends with her. She had a vibrant spark in her eyes and a confidence that is not commonly observed in the women from Andahuaylillas. As I began to speak to her and learn about her journey of healing, I became so inspired by her. In her I saw the journey of liberation and truth I have been on, and that so many beautiful women I know strive everyday to achieve. She got married at a very young age, 17, and became widowed and a single mother at age 18. In time she married again, to a man that abused her verbally and repeatedly reminded her that she was “used goods.” He told her she was lucky she had found someone who would want to marry her, especially because she had a son my another man. In the midst of the abuse, she lost the will to live. She had lost all understanding of the purpose of life. Her work at Q’ewar helped her to find that purpose again and have a more concrete vision for the kind of life she wanted to begin to work toward. We had conversations in which we both held a sacred and respectful space to be able to share some of the most intimate and painful parts of our lives. One image that she shared with me that was so powerfully imprinted in my mind was one of her sessions with a local psychologists she had begun to visit when she felt she had nothing to live for. As she sat in his office describing the degrading experiences she lived with her husband, he grabbed her hands and told her she was consumed by fear, so much fear she had forgotten how to live. He then covered her mouth with his hands and she began to feel a sense of suffocation. A slow loss of breath, an oppressive heaviness in her chest synonymous to the overwhelming fear that was dictating her life. He pressed his hands harder against her mouth and nose. She became agitated and tried to shake her head away with no success, until she gathered enough strength to pull his hands off her mouth and push him away from her. He then raised his voice at her and asked, “Quien respira por ti! Quien respira por ti! Quien respira por ti!” (Who breathes for you!) Over and over, until she sreamed back, “Yo, you respiro por mi!” (I breathe for me!) She now speaks without her voice quivering or her hands shaking. She says she is not afraid anymore. Her life is hers to create. Like many of the women, when she started working at the Q’ewar project, Paulina wouldn’t look at anyone in the eyes; didn’t feel worthy enough, to. At Q’ewar she learned about labor laws and just labor conditions. Simple regulations like keeping track of the hours she worked, understanding full-time and part-time shifts, knowing she had a right to two breaks during an eight-hour shift, and demanding overtime pay when she worked over her eight hours empowered her to demand dignity, both at work and her house. Here was a seemingly vulnerable, but confident woman starting her own quiet revolution; beginning to assert her truth and demanding the dignity she was born to deserve. When Don Julio began this project, he hired three women, whom he paid from his own salary as a teacher. The project now hires over 40 women. More than 60% percent of the women have been able to build their homes from the sustainable work they do at the project. Many have also been able to find the self-reliance they needed to leave their abusive spouses. The Q’ewar project has also expanded into other areas. They have an on-site kindergarten school, “Wawa Munakuy” (giving love to children – in Quechua), based on the Waldorf pedagogy, which strives to transform education into an art that educates the whole child – “the heart and the hands, as well as the head.” The children of the women that work at the Q’ewar project attend the kindergarten school free of charge and are supplied with all the materials they need for learning. The blueprints for the expansion of the school to include primary grades have already been created, and Don Julio along with supporters are working on raising funds to see this vision come to fruition. Change happens when opportunities are created for people to empower themselves and have ownership and determination over their lives. One last anecdote: One of the students during the last session bought a doll, specifically assembled to reflect the student’s physical features. When the student saw her doll, she became overwhelmed and welled up with tears. The women, concerned with her reaction, questioned what was wrong, to which she responded that it was “so beautiful and the first time [she] had a doll that looked like [her]. The student was of Indian heritage and had lived in the United States her whole life, yet it was in this magical place that she finally found the very thing that would allow her, like the women, to rescue a piece of the self-acceptance she had struggled for so long to experience.